How a Business Loan For Taxes Helped This Deli Owner Pay the Bill! Amanda O’Ryan, owner of a popular delicatessen in Green Bay, Wisconsin was in need of additional working capital fast. Unfortunately, due to a shortage in certain cheeses and meats, the deli wasn’t doing so well. As the New Year was quickly approaching, she knew she had over $15,000 to pay in taxes and other expenses and wanted to take care of them ahead of time rather than later. Amanda knew that if she waited to take care of the issue, she would be in more of a bind due to the decrease in revenue. After speaking with a few friends who were also local business owners, Amanda opted to avoid a traditional bank loan and decided to do some research on alternative financing companies. She needed a business loan for taxes and needed it as soon as possible. There was no time for a lengthy application process or strict rules and guidelines. She then stumbled upon Excel Capital Management. Ms. O’Ryan gave one of the funding specialists at Excel a call and was told that all she needed to provide in order to be presented with a business loan offer was four months of recent bank statements, four months of recent credit card processing statements, and a simple, one-page application. No minimum credit score or collateral requirements! Luckily, being as organized and thorough as she is, Amanda already had all of her documentation ready to go and quickly faxed it over. Within 24 hours, Excel was able to present Amanda with an business loan offer in the amount of $22,000. This would allow her to cover taxes and even have some additional capital left over for deli equipment repairs and a few cosmetic upgrades for the business. Without hesitation, Ms. O’Ryan quickly accepted and was funded the very next day! 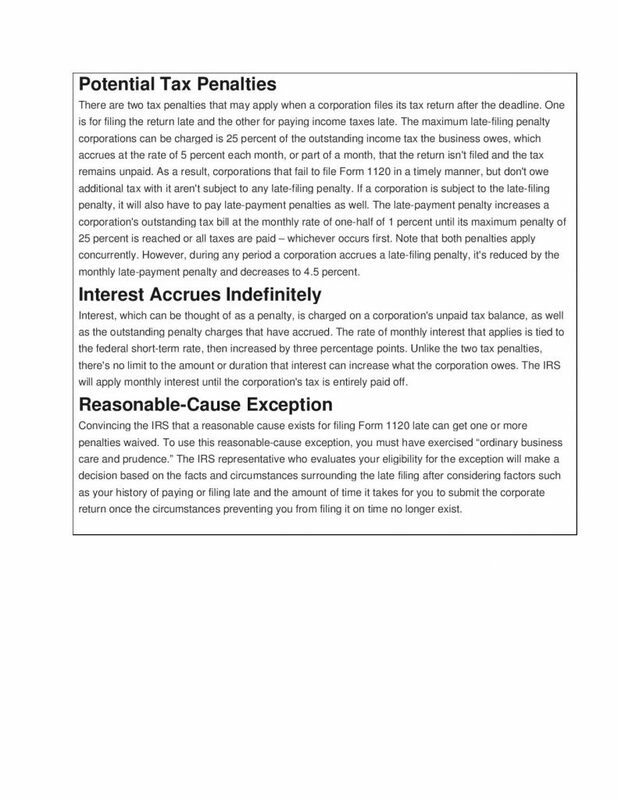 As you know, failing to pay corporate taxes on time can lead to hefty penalties and interest rates! Obtaining a business loan for taxes and dealing with low, flexible payments is much better than paying Uncle Sam! Don’t fall victim to the tax penalties below (credit: Michael Marz for azcentral.com)! APPLY NOW for the working capital your business needs!